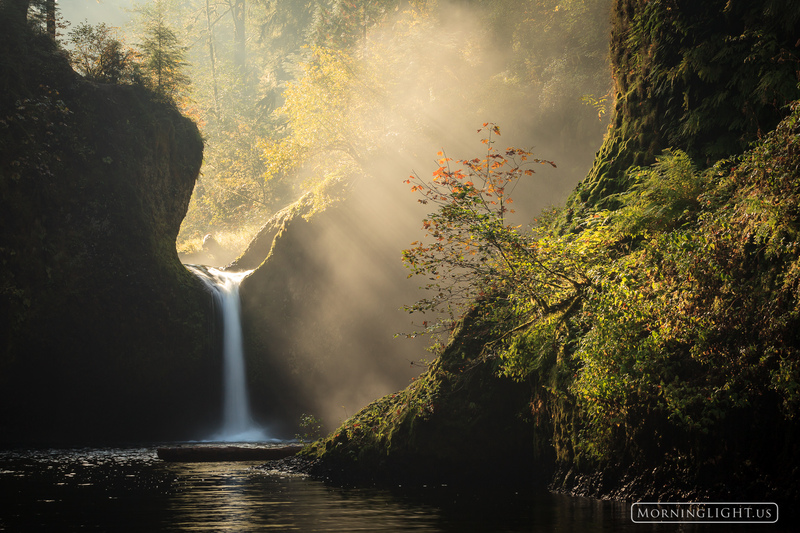 An idyllic scene in the Columbia River Gorge as mist rises over a beautiful waterfall just after the start of this new day. One of the places I've seen time and time again in photographs is Punchbowl Falls in the Columbia River Gorge of Oregon. Because it has become something of an icon I almost didn't visit it, especially as the weather was not the overcast and rain that was forecast but sunny skies which generally aren't good for photographing waterfalls. For some reason I decided to at least go and have a look. The scene turned out to be even more beautiful than I expected with mist rising over the falls illuminated by the sun. Thanks to my friend +Koveh Tavakkol's suggestion I brought my wading boots with me and was able to get this and several other photos of the falls. Photo © copyright by Erik Stensland. « Back to search results for "Waterfalls"
We now also offer a unique framing system for our plaque mounted images. This option is perfect if you are wanting a more traditional frame but want to benefit from the great features offered by plaque mounting. The frames we are using are about 2" thick and create the impression that the plaque is floating within the frame by use of a gap between the inside edge of the frame and the plaque. These frames come in both walnut and black and are an affordable way to take the photo to the next level. You can order prints in various formats such as print only, plaque, framed plaque, acrylic or matted. Upon special request, we also offer our prints in canvas. For more information about the display options, please see the prints page.